Is Rihanna the Succubus Back in Kemp's Life? With a Hat Tip to Left Field Pavilion I bring to you the latest in Dodger gossip. Specifically, who is Matt Kemp dating now! BTW, check out Left Field Pavilions photoshopped pic, it's a gas. Via Amethyst Tate at the International Business Times, we learn that Matt Kemp was recently spotted having a cozy dinner with former lady-friend Rihanna. The Barbadian beauty is back with ex-boyfriend, Matt Kemp, who plays baseball for the Los Angeles Dodgers, Hollywood Life said. They first dated in January 2010, but the two broke up after almost a year, citing the strains of a long-distance relationship, a source told the New York Daily News. "She basically was just over it," and Kemp was not able to “keep up with her crazy travel schedule," the source said. Moreover, Kemp was "sick of always following after her like a puppy dog all over the world. He wants something more normal," the source added. To this I say, "Nooooooooo!" I'm sure we all remember the last time these two were together. Matt had a very un-Kemp-like year, although his numbers would make all-stars out of most other men. Still, I don't like the prospects of him being distracted due to the demands of a starlet of her level. On the other hand, I'm not surprised if she finds herself falling for Matt again. After all, Kemp strikes me as a real gentleman. I just would prefer that Matt stick to Baseball, and to finding someone normal. Of course, what right do I have to tell him what to do. So, there's that. Since I've been on a fantasy card making kick lately, I thought I would make the below Matt Kemp & Rihanna Baseball card. Here is another great pic from the Scout's dinner this past weekend. 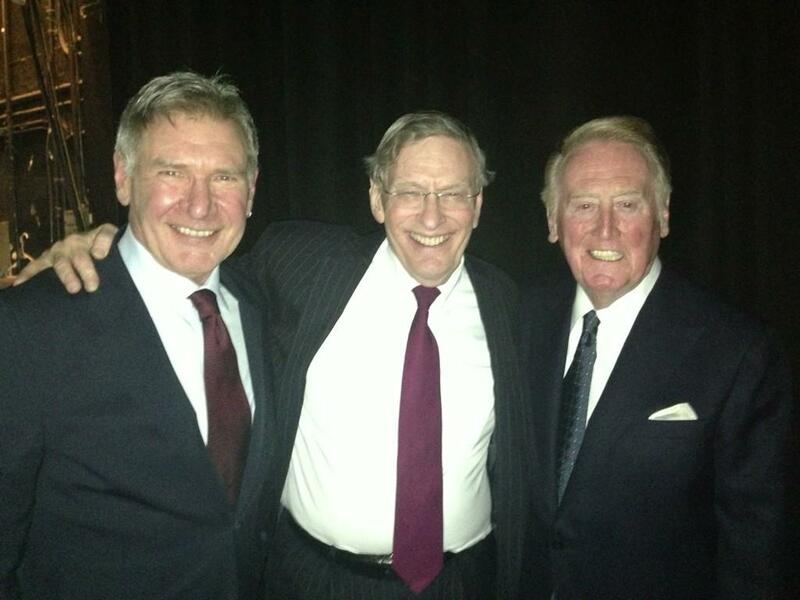 This time, Harrison Ford joins Bud Selig and Vin Scully. Pic via twitter @Dodgers. Emma at Dodger Blue World has decided to start writing biographies on every living Brooklyn Dodger. She starts with Mike Sandlock. Keep up the great work Emma! 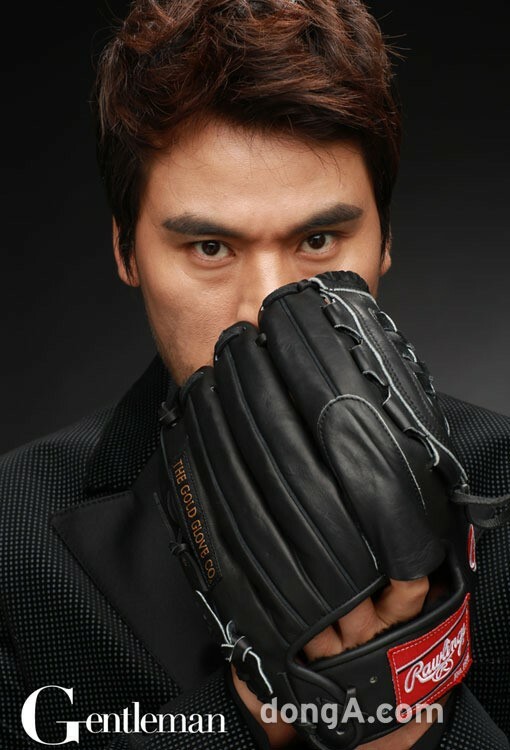 Check out Chan Ho-Park in a tuxedo for 'Gentleman Korea' magazine. One pic is on the right. RIP: Former Dodger Enzo Hernandez was recently found dead from an apparent suicide, via AP on USA Today. The Dodgers’ 2013 individual game pricing starts at $8 per ticket for One-Star games, $10 per ticket for Two-Star games, $20 for Three-Star games, and $30 per ticket for Four-Star games. Via Flip Flop Fly Ballin', we learn that they almost turned Chavez Ravine into a zoo before it became Dodger Stadium. I call "Bunk!" on the rumor that the Dodgers are looking into reliever Rafael Soriano as tweeted by Buster Olney. It would be a silly move for the Dodgers to pay his salary and lose a draft pick. I believe this is a rumor floated by Soriano's agent (Boras) to get the bidding up higher. On a side note, have you notice how the Dodgers are thrown around as interested in everybody? I assure they are not. It's just mutually beneficial. The agents love spreading these rumors in order to help their clients, and the Dodgers don't mind since it adds some favor with those agents since they are likely to work with them in the future. jbox at Gaslamp Ball brings us the story of the Adrian Gonzalez autographed photos with the tagline, "I Bleed Dodgers Blue..."
Here is another vintage Brooklyn Dodgers Baseball card in my collection. This time I show you a 1922 Exhibit card of Walter "Dutch" Ruether. These cards are much larger than your typical Baseball card (about the size of a modern postcard), and were produced by the Exhibit Supply Company of Chicago. They were distributed solely in vending machines. For the price of a penny you pulled out a couple of cards. The back of this card is blank, although in subsequent years a postcard back was added. 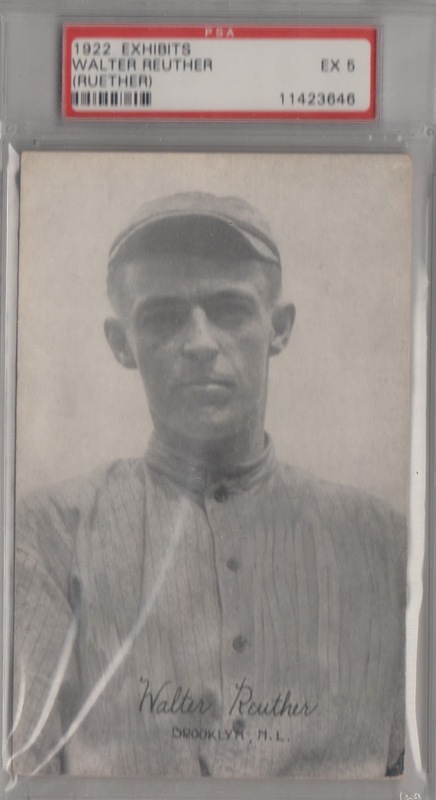 Dutch Ruether - notice the card above misspells his name - was a starting pitcher for the Brooklyn team from 1921 to 1924. He came to the Brooklyn Robins (as they were known back then) by way of a trade with Cincinnati for future Hall of Famer Rube Marquard. Overall, he compiled 54 wins, with a 3.97 ERA, and a 99 ERA+ with Brooklyn. Below are his career stats, via Baseball-Reference. Is This Jackie Robinson's Last Home Run Ball? Oftentimes, Baseball collectible message boards can provide a wealth of knowledge, as well as, some great personal stories. Fortunately, a couple of weeks ago I came across one such thread at Net54. A poster by the name of Steve relayed a great story about a family heirloom that is a wonder to behold even though it may be impossible to prove. First of all, I wanted to express my thanks to Steve for allowing me to share this. 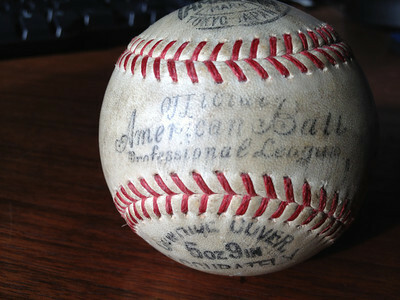 My father had this baseball in his sock drawer for as long as I can remember. He passed away four years ago and I brought it home with me and it has been sitting on my desk ever since (except on a few instances when I had to take it away from my dog). I remember when I was young I asked my father about it and he told me he caught it at a game when he was in the Army and was stationed in Japan. He said he went to the baseball game and he caught this home run ball by reaching over "a little Japanese man sitting in front of him that thought he was going to get it (my father was 6'-2"). 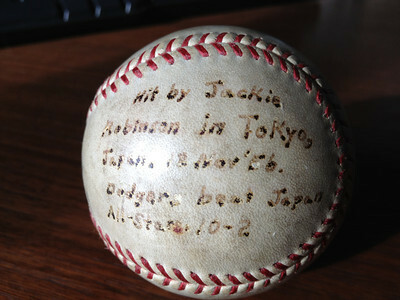 He wrote on the ball, "Hit by Jackie Robinson in Tokyo, Japan, 12 Nov '56, Dodgers beat Japan All-Stars 10-2". Being that childhood memories can be foggy, I asked my mother (who is now 77) what she remembered about it and she recalled that "he caught it when he was in Japan and it was hit by some guy and I think it was the next to the last home run he hit, or something like that. Didn't he write what it was on the ball?" Jackie Robinson, Gil Hodges, Roy Campanella and Pee Wee Reese each connected for home runs as the Dodgers rolled to a 10-2 win, their final appearance in Tokyo on the 1956 Goodwill Tour to Japan. Roger Craig was the beneficiary of the offensive onslaught as the Dodgers took a commanding 8-1 lead after six innings. Robinson, appearing in his next-to-last game as a Dodger, belted his final home run in a Dodger uniform and it was a memorable one — a 420-foot shot off Shoichi Kaneda in the second inning. So there you go. Jackie did in fact hit his last home run in a Dodger uniform in this game, and if Steve's family story is true then this is that historic home run Baseball. Unfortunately, there is likely to be no way to actually prove that it is the real ball. 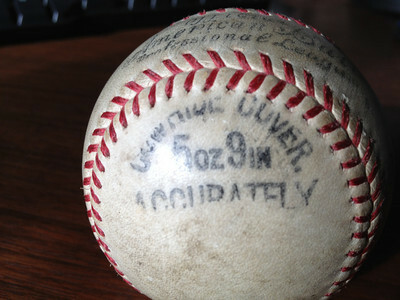 Heck, you would think that Steve's father would have written home run ball on it rather than just "hit by". After all, 50+ year old memories have a tendancy to change over time, and it could just as easily have been a foul ball hit by Jackie Robinson. Of course, if a photo from that event ever popped up that pointed to the crowd as the ball landed in the stands, then that could shed some light and provide verifiable proof. Still, even without actual proof it's a great story and an awesome family heirloom. Below are more pics of the Baseball from different sides. 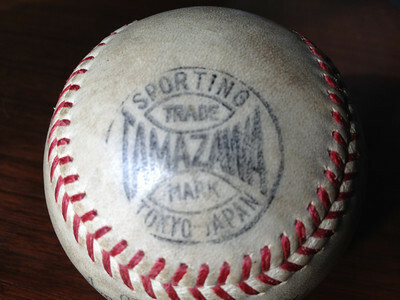 It's a Tamazawa Baseball which was known to have been a brand used in Japanese Baseball. Again, a big thank you to Steve for allowing me to share his story and pics.